Call of Cthulhu is the original short story by HP Lovecraft that has since spawned the whole Cthulhu mythos, with films, video games, roleplay games and many novels by authors in the shared Cthulhu universe (known as the Cthulhu Mythos or the Lovecraft Mythos), which was the intent of Lovecraft. These authors have included the original friends and aquantencies of Lovecrafts such as Clark Ashton Smith and Robert E. Howard. 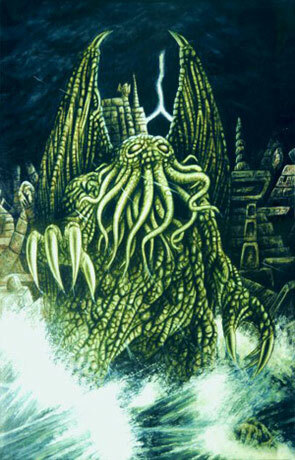 Lovecraft himself created a number of short stories that are related to Cthulhu. Brian Lumley has also since created 6 full novels based on the Cthulhu Mythos, each featuring the characters Titus Crow and Henry deMarigney. These stories differ in Lovecraft's interpretation by the way the characters are more directly involved and do fight back. The Short story itself is described from the first person perspective in a documentary style and is divided into three distinct sections relating to three witness accounts of Cthulhu related incidents. The prose is quite poetic and subtle in places with a complex and dramatic plot. The three chapters are narrated by way of a recovered manuscript detailing notes of discoveries that relate to terrors from the deep, separated into one chapter per discovery with the final third chapter detailing the further discoveries of the narrator Francis Wayland Thurston. The first chapter "The Horror in Clay" tells of a sculpture created by Henry Anthony Wilcox and based on his vivid dreams of a horrific creature that has a tentacled head, a scaly body and rudimentary wings, as you would imagine if you combined an octopus, a dragon, and a human caricature. The second chapter deals with the Tale of Inspector Legrasse, a New Orleans police officer who held a meeting at the American Archaeological Society in an attempt to identify a statuette that have been recovered after a raid on a voodoo meeting. The statuette bears a striking resemblance to the sculpture of Henry Wilcox. The final chapter, "The Madness from the Sea" details the further investigations of Francis Wayland Thurston and he finds much more than he bargained for. Call of Cthulhu is a great piece of literature, elegant, thoughtful, faintly disturbing and above all entertaining. For anyone beginning their hunt for Cthulhu, this is the ideal place to start. The original short story is now out of copyright and can be picked up free of charge, when time permits I will add a download to this page. Written on 15th December 2010 by Ant.